When the ancient kings of Lan Xang founded their capital Luang Prabang, they thought they’d hit the jackpot. Set at the junction of two rivers (the Mekong and the Nam Khan), isolated by surrounding mountains and centered by a sacred hill (Phousi), Luang Prabang checked all the boxes for a city enjoying both earthly and divine protection. History may not have been kind to the Lan Xang and Lao Kings over the centuries that followed, but the capital has (somehow) retained its age-old magic. Its French-Lao architecture; its graceful temples and townhouses; and its Mekong-side access to Laos’ countryside keep Luang Prabang a major tourist draw (validated by its UNESCO World Heritage Site status). To see the best of Luang Prabang, consult this list: these landmarks represent the can’t-miss destinations you should visit if ever you’re in Laos’ cultural center. Ever since Luang Prabang’s founding, its temples have harbored small communities of Buddhist monks, altogether numbering in the hundreds across the city. You can see most of them emerging at the crack of dawn: a silent queue of orange-attired boys and men, holding out their alms bowls to receive food or money from devotees lining the street. The tak bat morning ceremony fulfills the mutual obligations of ordinary Buddhist devotees and the sangha (monastic community): by receiving, the monks receive their basic needs, and by giving, an ordinary Buddhist earns merit on the road to Nirvana. Even non-Buddhists are allowed to take a spot at the giving queue, with vendors selling sticky rice or other foods to place in the begging bowls. If you prefer to observe instead, remember to keep a respectful distance – don’t touch or obstruct either monk or devotee as they perform this age-old ritual. Image of National Museum © Getty Images. The National Museum (location on Google Maps) was once the Royal Palace, built between 1904 and 1909 out of brick and stucco. Within its walls stand a number of significant religious and cultural artifacts; one of them stands out in importance, the 50kg golden standing Buddha known as the “Pra Bang” that gave the city its name (Luang Prabang means “City of the Pra Bang”). After the French presence in Indochina disappeared, the Communist government imprisoned and exiled the last of the royal family when they took over in 1975... but the authorities have wisely preserved the royal treasures at the museum. The royal throne room and the private chambers have been kept as they were, and the royal regalia have been put on display along the corridors. Entrance fee into the museum costs LAK 30,000 ($3.76); photography and shoes are prohibited inside. That Phousi (location on Google Maps) is a hill in the middle of the town; its central location and height of 500 feet affords it amazing views of Luang Prabang, the Nam Khan River, and the National Museum. The hill offered more than just a pretty view for Luang Prabang’s original founders – they saw it as a sacred area akin to Mount Meru of Buddhist mythology, and used it as a central point from which the rest of Luang Prabang radiates. Visitors ascend 328 steps to the top of That Phousi and the temple at its peak. The temple, known as Wat Chom Si, was built in 1804, and its gilded stupa can be seen from almost every point in Luang Prabang. Entrance fee to Wat Chom Si costs LAK 20,000 ($2.36) if you’re a foreigner. Wat Chom Si is highly regarded by Laotians as one of the city’s most sacred sites; if you’re planning to ascend to this point, you’ll need to dress and behave properly as befits a sacred Buddhist temple. Over 300 hawkers selling handicrafts, spices, souvenirs and food crowd the night market along Sisavangvong Road (location on Google Maps). Their wares are relatively cheap, and can get even cheaper if you put your haggling skills in play. Sellers come from all over Luang Prabang province, and offer a gratifyingly high amount of hand-crafted goods, from aluminum implements recycled from the remnants of American bombs (I wish I was kidding), to indigo-dyed fabrics made by Hmong weavers, to bags made from traditional textiles. Look for the Handmade in Luang Prabang seal to be absolutely sure. Even if you’re not buying anything, you can get a feel of the local culture just by walking among the stalls and watching business go down in the night market. Just like Luang Prabang, the vibe in the night market is more relaxed; you can look around without hurrying through the stalls. The night market opens nightly from 5pm to 10pm. Some two hours’ boat ride from Luang Prabang takes you to a sacred cave located high in a cliff overlooking the Mekong River’s edge. Over 6,000 Buddha images line the interior of Pak Ou Cave (location on Google Maps), each of them put there by a reverent local for merit-making purposes. The Buddha images come in all sizes and shapes, united only by their identity and purpose. The practice of placing Buddha images in Pak Ou Cave is centuries old; newer Buddha images stand alongside ancient ones, the differences only given away by their patina and wear. Many villagers bring damaged or aged Buddha images here to serve out a venerable retirement (trashing them would be sacrilegious to any devout Buddhist). Commuter boats make their way every morning from Luang Prabang’s riverside to the Pak Ou Caves, taking two hours to make the 20-mile journey. An entrance fee of 20,000 LAK will be charged before you enter. The Kings may have left, but their craftspeople have stayed behind. Luang Prabang retains its reputation as a cultural hotbed thanks to the artisans who still work from shops around the old district, producing textiles and handicrafts on demand for the tourist trade. Some of the finer products come from shops like Ock Pop Tok (website, location on Google Maps), a female-founded, female-run social enterprise with a Living Crafts Centre in downtown Luang Prabang; and Passa Paa (website, location on Google Maps), an outlet for handmade Hmong tribal handicrafts. To see silk at the source, travel two miles north of Luang Prabang to Ban Phanom, a village dedicated to the fine art of weaving traditional fabrics. Ban Phanom Village used to be the official purveyor of silks to the Lao royal family; the town’s accustomed business goes on even without the kings today. Many of their wares find their way into the night market mentioned above. Over 30 temples can be found around Luang Prabang, each harboring a community of Buddhist monks and harboring a history dating back to the Lan Xang kings. Compared to the temples of Thailand or the ones in Myanmar, Lao temples tend to be more down-to-earth and human-scale, but make up for the lack of size with a wondrous excess of decoration. If you only have time to visit one temple, make it Wat Xieng Thong (location on Google Maps). Completed in 1560 by King Setthathirath, Wat Xieng Thong grew in importance to become a revered royal temple under the direct guardianship of the Lao Kings; in fact, the monarchs were often crowned in the wat itself. The temple is one of Laos’ most beautiful, and is decorated as befitting a royal site: a three-layered roof tops the structure, gilded doors at the entrance show moments from the Buddha’s eventful life, and the Red Chapel’s walls are adorned with mosaics. The entrance fee costs LAK 20,000. The compound is open to visitors from 8am to 5pm every day. A hobby turned into a prospering business, the Laos Buffalo Dairy (website, location on Google Maps) hosts travelers who want to see water buffalo making dairy products. The dairy was started by expat guesthouse owners who complained about the high price of cheese in Luang Prabang; by renting buffalo from local farmers instead of buying , Laos Buffalo Dairy keeps production costs low while spreading the benefits around the local community. Word of mouth has gotten around, and now Luang Prabang’s top hotels call on Laos Buffalo Dairy to fill up the local dairy shortfall. The product list includes mozzarella, ricotta, feta and yogurt, with a few other cheeses in development (buffalo milk is fattier than cow’s milk, so any new products undergo a tortuous trial-and-error process). Luang Prabang tour agencies will be happy to arrange a visit to the dairy, where you can see their cheese-making process, or get to know the water buffalo working the farm. A limestone-based landscape just looks better, as places like the Philippines’ El Nido and Vietnam’s Ha Long Bay beautifully demonstrate. Luang Prabang is no exception – as shown by Kuang Si Waterfalls (location on Google Maps), a massive cascade of water that pours into several stepped, scenic pools at the bottom. The turquoise-aquamarine pools of water look almost unearthly, and very welcoming for swimmers too. Shaded by nearby trees, the pools make great swimming holes for sweaty visitors. Afterwards, take a snack break at one of the tables at the lower level pools. Set some 18 miles’ drive south from Luang Prabang, Kuang Si Falls are accessible by tuk-tuk or by buses leaving from Naluang Mini-bus station in the city. Apart from the waterfall, visitors can also check out a nearby sun-bear shelter, which houses bears rescued from Chinese Traditional Medicine practitioners. 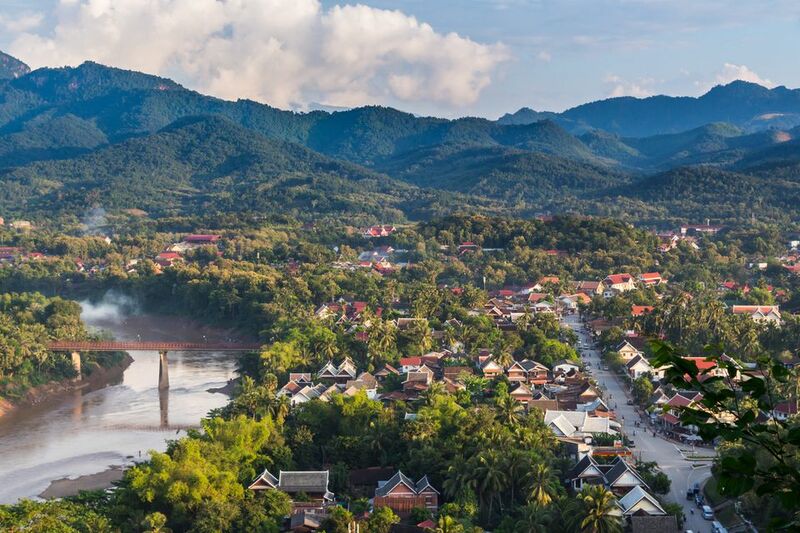 Spend your Luang Prabang downtime where the Beerlao flows as freely as the Mekong’s waters. You’ll find a number of riverside bars and restaurants overlooking either the Nam Khan or Mekong. This writer can recommend two places based on personal experience, both of them run by boutique hotels across the road. The Belle Rive Terrace (website, location on Google Maps) serves a fusion menu of Lao/European dishes with large, frosty bottles of BeerLao. The narrow terrace limits the number of patrons at any given time, offering a sense of privacy and exclusivity that’s harder and harder to find around Luang Prabang. The Mekong Riverview’s Viewpoint Cafe (website, location on Google Maps) is set in a garden at the very tip of the Luang Prabang peninsula, overlooking the site of a seasonal bamboo bridge that appears during the dry months (locals let the bridge fall apart during the monsoon season, then rebuild it afterwards). The lush garden setting makes an excellent backdrop for their spread of traditional Lao food and surprisingly wide-ranging bar menu.